Is helping to insure the safety of your workers a concern? Unable to install a high-tech security system with time stamped magnetic card recognition? Over the years, C-Line Products' Time’s Up!® Security Badges have helped many companies easily identify visitors and manage traffic within their facilities. Now these badges can be printed with a direct thermal printer without compromising any of the security features. Upon expiration (1 day), Time's Up!® Security Badges reveal a highly visible color indicator that can be seen from up to 50 feet away. These peel and stick 3 x 2 security badges are a cost-effective way to help deter and eliminate unwanted visitors from roaming your facility undetected. The customizable name badges add an extra layer of security by themselves, or can complement an existing system for additional security. Also available are Time's Up!® Security Badges Direct Thermal Printers, which are safe for use in Dymo, Zebra and Seiko direct thermal printers. Direct thermal printers allow for a more professional look and feel, and make the badges easier to create. Time's Up!® Security Badges are easily customizable. Just enter the visitor's information and print. 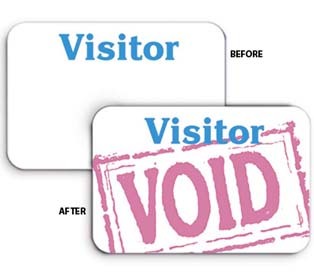 After one day's use, the clearly recognizable VOID message stands out to deter attempts at unauthorized re-entry and alerts employees that a visitor may not be welcome. C-Line Products, Inc. is a leading manufacturer of storage, protection and organization products for the office products industry. The company is headquartered in Mount Prospect, IL, and maintains distribution facilities in Sacramento, CA and Mount Prospect, IL. For more information on Time's Up!® Security Badges, contact Jean Andersen at (800) 323-6084 x3361 or jandersen@c-line.com.